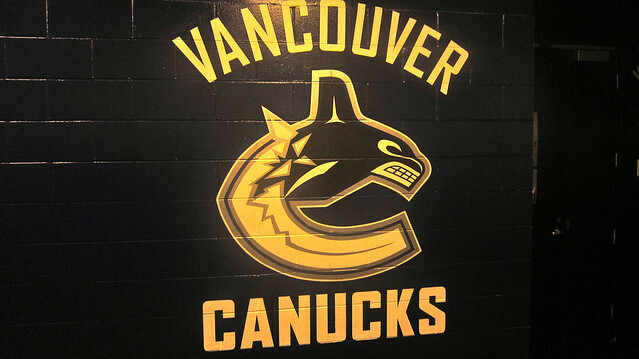 Check out my hockey audio podcast, The Canucks Report. 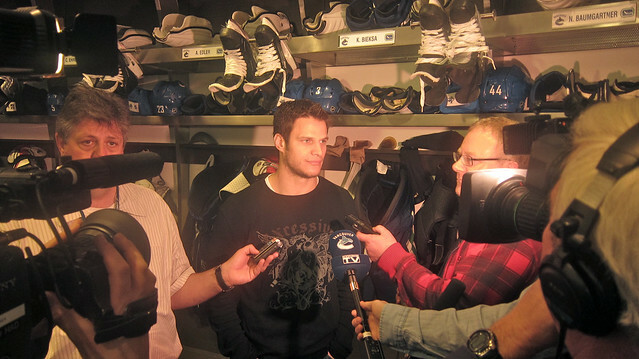 It features interviews with forwards Ryan Kesler, Alex Burrows, Kyle Wellwood, and defenceman Kevin Bieksa of the Vancouver Canucks that I (sort of) conducted at GM Place, yesterday. 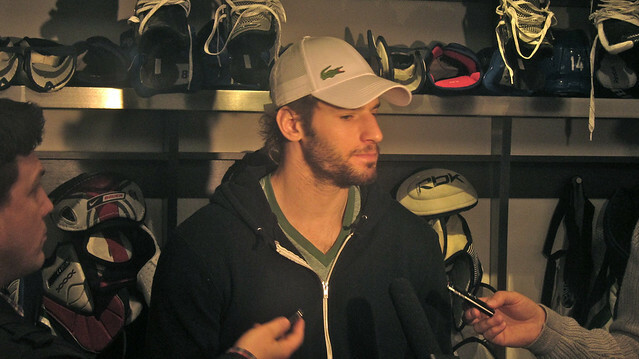 Hear them talk about defeating the Los Angeles Kings in the first round of the NHL Stanley Cup playoffs and looking ahead to facing off against the Chicago Blackhawks in the second round. This week, I started off my first rotation for my news reporting practicum at Evolution 107.9 radio for BCIT Broadcast News. I started on the sports beat. Yesterday morning, the day started off with a call from my sports editor, Zameer Karim. 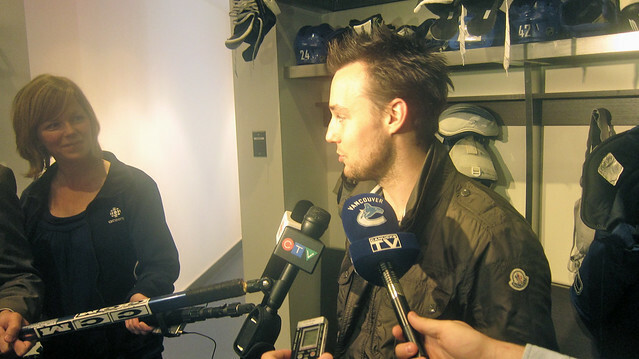 He informed me that I would be assigned to the a Canucks media event in the bowls of GM Place (actually, just the players dressing room) where they would make a handful of players available for interviews after they had advanced to the second round the night earlier. I was fairly nervous and intimidated by the whole endeavour. I arrived extremely early (upon the advice of one Mr. George Orr) to make sure I would not be late and have plenty of time to get where I needed to be. I was surprised by how easy it was to get into GM Place. I simply went to the staff entrance gate and signed in with security and told them who I was and what I was doing there and they let me right in sans any problems. 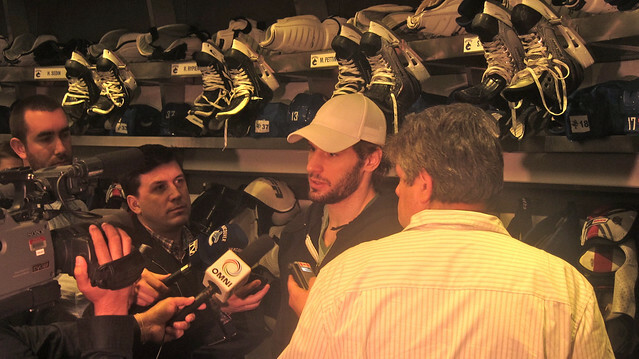 Immediately, I was huddled in the hallway with all the local Vancouver sports press. Think Jason Botchford, Perry Solkowski, Kristin Reid, Ian Hanomansing, Craig MacEwen and others. I felt excited but very out of place and intimidated by the professionals. I cannot imagine how I would have felt if I was actually more interested in sports reporting and knew more about sports, besides in a casual manner. I decided very early on, I would not ask any questions and just soak in the scrum to avoid saying or doing anything stupid. The sports beat felt like a boys club with a cutthroat vibe.